The other day, I had to cut a hole in some wood. No big deal really. I just needed to plug in my Mac in the new office space, which necessitated a small hole in the back of a shelving unit. So what’s a man do when he has to cut a hole in some wood? He goes to Home Depot. That’s right, he goes to Home Depot and buys a saw. I like the Home Depot on North Avenue because it’s open 24 hours. But that’s not the only thing to like. I also like it because it has a Chicago Red Hots in the vestibule of the exit area. We’ve all seen the signs for Red Hot Chicago, the maker of Chicago style hot dogs and other fine meat products. But I’m not so sure that this hot dog stand is associated with the Red Hot Chicago company. They have the words “Chicago Red Hots” prominently displayed as their name. However, it’s probably an independent shack of some sort that serves products made by Red Hot Chicago. This is all just speculation. I don’t really care. I was just focused on finding the right saw to cut a hole in some delicate backing material on a shelving unit without ruining the aesthetics of my new office space. For me, that’s some heavy construction, and requires a lot of thought. So much thought, that I almost forgot to eat lunch. It was already around 2pm and I hadn’t had food since 8am, so I was hungry. When the burly security guard checked my receipt and let me pass, I made a beeline to the hot dog stand. I ordered up the all-beef polish sausage with mustard, hot peppers, and celery salt ($3.50). No tomatoes and pickles for me, sorry Chicago. It was good, real good. I can still taste it 6 hours later. I mean, I can really still taste it. The polish sausage is classic Chicago street food. It’s even more classic when it comes from a hot dog stand. 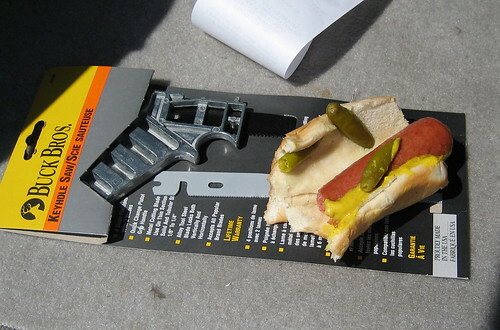 Dammit, I just bought a saw; and men that buy saws at 2pm on weekdays don’t hesitate to stop at hot dog stands for some lunch. That’s just the way it works. Posted in food on 2007/05/19 by John.